Treehouse Big Day Out Festival! I don’t know about your house, but in my house Treehouse TV, Canada’s #1 specialty channel for preschoolers, is pretty much the main channel we watch. 5 years ago after my first son was born there was no other channel he wanted to see other than this one! I know all you moms and dads out there will agree! I’m so excited to tell all my mom and dad readers the latest news. 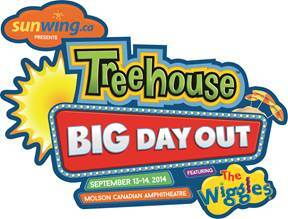 Toronto is going to be holding the first annual Treehouse Big Day Out festival! The festival will take place September 13 and September 14, and will feature must-see performances by The Wiggles – the number one children’s entertainment group , fan favourites, Max & Ruby and award-winning Canadian children’s music duo Splash’N Boots. Not to mention tons of other engaging activities (Costume Character Meet-and-Greets, Face Painting, Arts and Crafts, Interactive Games and Much More). I can promise that this will be an event not to be missed! Presented by Sunwing.ca, the event will be held at the Molson Canadian Amphitheatre both September 13th and 14th; 9:30am – 12pm and an afternoon show from 2:30pm – 5:00pm. It will also be televised on Treehouse on Saturday, October 4, at 5:00 p.m.
To add to the excitement, Sunwing.ca is hosting a special sweepstakes that runs until September 15, for a family of four to win a trip to the luxurious and family-friendly Royalton Punta Cana Resort and Casino in the Dominican Republic. Parents can visit http://sunwing.ca/bigdayout to enter the contest or stop by the Sunwing booth at the Treehouse Big Day Out festival to enter and learn more about other exciting giveaways and coupons. Tickets for Treehouse Big Day Out may be purchased at Ticketmaster. Additional information about the event can be found at http://www.treehousebigdayout.com. So what are you waiting for? Get your tickets now! And have a Rockin Weekend! !